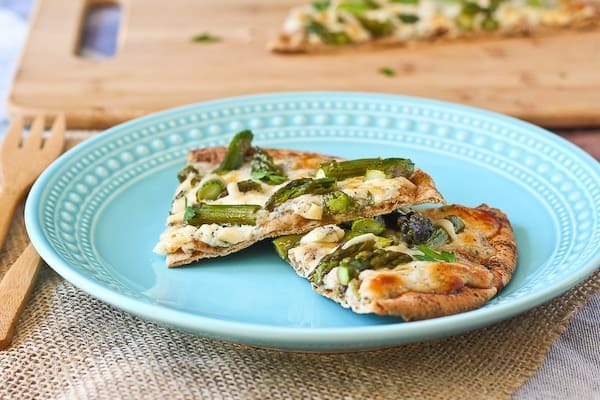 Make your lunch a summertime treat with this easy and filling pita flatbread topped with creamy herbed cottage cheese and fresh, green asparagus. LUNCH TIME. It’s really not my favorite. You know, it’s WAY too easy to order Jimmy John’s delivery…why do they have to make it so easy with the delivery?! And it really is freaky fast. That beach club unwich with sprouts and bbq chips is at my door in about 10 minutes flat. I can barely make lunch in ten minutes. But – you could make this in nearly ten minutes. Or 30. But it will go by quickly. (Minor details, people!) 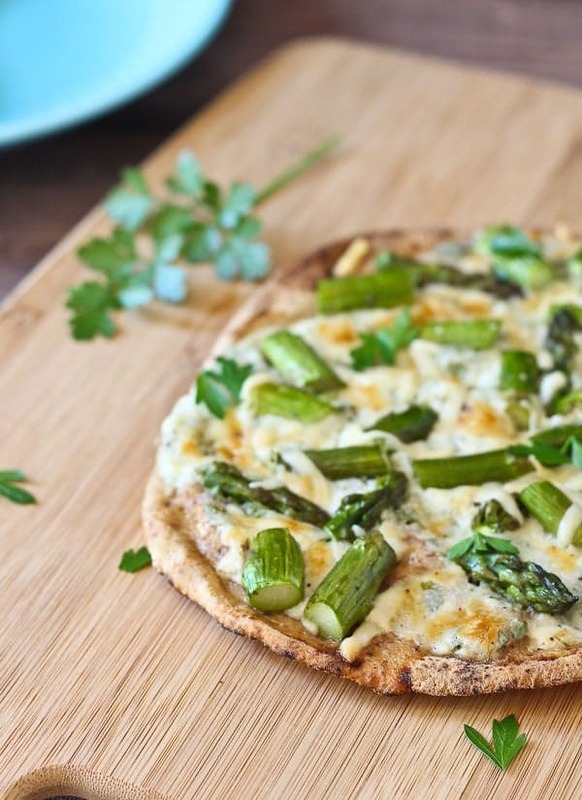 This flatbread has crispy edges, creamy and flavorful cheese, and crispy and summery asparagus. This pita flatbread definitely gives JJ’s a run for their money. I used an ultra-thin whole wheat pita which made a perfectly crispy crust. 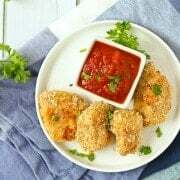 The cheesy sauce is made of pureed cottage cheese mixed with herbs and some super-sharp grated provolone cheese. 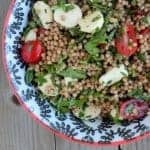 The asparagus on this is perfect for summer but it really could be swapped out for any one of your favorite vegetables. Whatever is in season, or whatever is in your fridge. Some zucchini and summer squash would be awesome. Tomatoes – yes. Roasted mushrooms – always a good idea. I made this pita flatbread in my oven because I was making a few but if you want to reduce the recipe to a single serving, you could easily pop this in a toaster oven. I think they’d work great on the grill too, if you don’t want to heat up the house! Happy lunching! Stay away from JJ’s. Or don’t – those sandwiches are darn good. 2 tablespoons finely chopped herbs (I recommend a combination of parsley, basil, chives, or dill) – additional for garnish if desired. Toss asparagus with olive oil on a parchment-lined baking sheet. Season with salt and pepper. Roast asparagus in preheated oven for five minutes. Meanwhile, place cottage cheese in a blender and blend until smooth. Pour or scrape using a rubber spatula into a medium-sized bowl. Stir in salt, pepper, 1 cup of provolone, and herbs. Stir until all ingredients are combined. Taste and add salt if desired. Remove asparagus from baking sheet and set aside. On a new piece of parchment paper, lay out the pitas. Divide cottage cheese mixture evenly between 3 pitas. Spread almost to the edges, leaving about a half-inch border of pita. 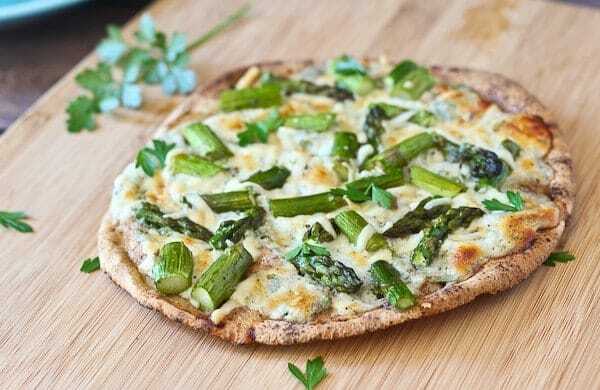 Sprinkle asparagus over the cheese mixture. Top with remaining 1/3 cup of provolone. Bake at 425 degrees Fahrenheit for 15-18 minutes or until golden brown. Serve immediately topped with fresh herbs if desired. Verdict: Loved this – I’ll be buying pitas and cottage cheese frequently from here on out. Husband’s take: He loved these too. The cheese was a little on the strong side from him (I found a super sharp provolone!) but overall he liked it. 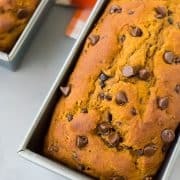 Changes I would make: None are necessary, but like I mentioned, it will be fun to try this out with different vegetables and toppings. Craving more pizzas and flatbreads? Try: Grilled Pizza with Ricotta and Spinach, Chicken Enchilada Flatbread, Apple and Chicken Macaroni and Cheese Stuffed Crust Pizza, Bacon Leek and Parmesan Whole Wheat Flatbread, Jalapeño Popper Pita Pizza from I Wash…You Dry, or Blackberry and Ricotta Pita Pizza from In Sock Money Slippers. Or check out my Pinterest board devoted to the subject! 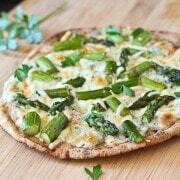 Follow Rachel Cooks | Rachel Gurk’s board Pizza and Flatbread Recipes on Pinterest. 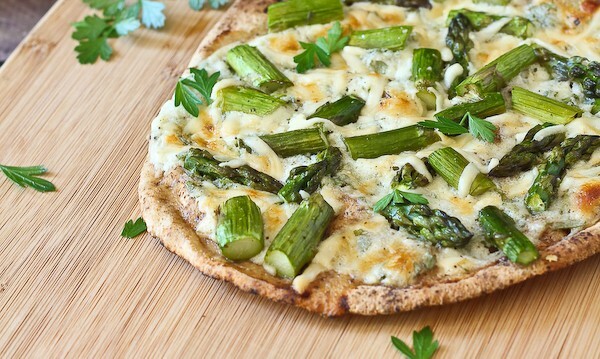 So cheesy, crispy and perfect, and those green specks of asparagus look so tasty in the ocean of cheese. I’d be the only one to eat it, but it sounds yummy. I love a good flatbread like this! So tasty!